Click here to see their rank for position players. Per game (he played in 139 and in one game he was just a pinch runner), he had .0770 WAR. That would be 9th best ever. See Mike Trout's WAR Per Game Is Historically One Of The Best (So Far). He also had, not surpringly, the best rookie season ever. See Does Mike Trout Already Have One Of The Top Ten Rookie Seasons Ever? To see the top seasons ever in WAR from Fangraphs, go to Best WAR Seasons For Position Players-Fangraphs. (thanks to David Appelman) They give Trout 10.0 and that is tied for 83rd best every. But, recall he only played 139 games. The average games played for the top 30 is 150. If Trout had played that many and had racked up the same rate of WAR per game, he would have had 10.8, good enough for 43rd. How Surprising Was Zito's Performance? He has not pitched well on the road this year or well against righties while the Cards hit very well at home and very well against lefties (more info below on this). 2.Add 1 point for each out recorded, so 3 points for every complete inning pitched. 3.Add 2 points for each inning completed after the 4th. 4.Add 1 point for each strikeout. 5.Subtract 2 points for each hit allowed. 6.Subtract 4 points for each earned run allowed. 7.Subtract 2 points for each unearned run allowed. 8.Subtract 1 point for each walk. In 32 starts during the regular season, he had an average game score of 49.53 (I came up with an average game score of 46.4 in the NL this year, so Zito was not much better than that). He is not a big game pitcher, either. His start against the Reds in the division series had a game score of 42. His previous 8 playoff starts averaged 55.13. Only 3 were 68 or higher with a high of 79 (way back in 2001). It is not like he came on at the end of the season, either. His average game score was 51.38 in his last 13 starts with a high of 66 and only 4 60+ games. He did have 4 starts this year with a game score of 72 or higher. But those were generally against below average hitting teams. (according to Baseball Reference, the NL league average OPS+ was 94, not 100 for some reason). The Cardinals were tied for 1st in OPS+ this year with 107 (tied with Giants). Zito had an ERA+ this year of 84. He was hurt last year and only pitched 53 innings. In 2010, his ERA+ was 94. The Cards had an OPS at home of .786 and .731 on the road while the league average was .718. They had .787 vs lefties but .835 vs. lefty starters. Zito allowed an OPS at home of .726 and .796 on the road. It was .823 vs. righties and .559 vs. lefties (the Cards started 5 righties, a switch hitter and 2 lefties). Now in his career it is .705 vs. righties and .701 vs. lefties, so maybe righties don't especially bother him. But this year he gave up 1 HR per 9 IP, which was the league average. His SO/BB ratio was 1.63, far below the league average of 2.50. I doubt anyone could have expected his performance last night. He is hardly an ace or stopper. The average game score by a lefty during the regular season against the Cards was 45.8. The highest by a lefty in Busch was 60 (Bumgarner). So Zito was well above both of those. In the Division series, Gio Gonzalez had 55 and 46. I don't think the Nats had any other lefty starters. Bumgarner had 22 in game 1. I think that is all the lefty starts agains the Cards in the playoffs besides Zito. Did I miss any? He hit 37 HRs in just 123 games, finishing 2nd to Ryan Braun's 41. 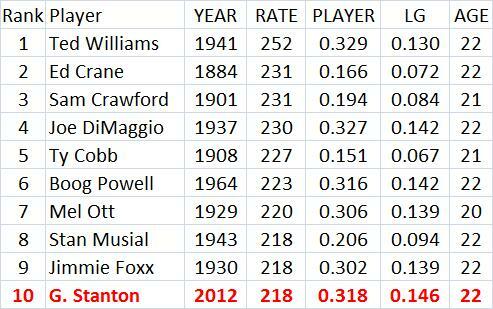 Stanton also set the all-time record for most HRs in a season by a Panoramian (yes, all-time!) His SLG was .608 while his AVG was .290. That gives him an isolated power (ISO) of .318, which, as I will show below, is outstanding for a player his age. But Marlins Park was not a good HR park this year. 113 HRs were hit there (by both teams) while 157 were hit in Marlin road games. So there were only 72% as many road HRs as at home. It is only one year, but that is a low HR park factor. Stanton's ISO at home was .287 while on the road it was .357. He had 16 HRs at home in 247 ABs while on the road it was 21 in 202 ABs. I can't help wondering how he would do in a fair park. I don't know how symmetric Marlins Park is, so maybe righties were not hurt as much as lefties. But he has a big home/road differential. The rest of the top 15 include Bob Horner, Mel Ott, Jimmy Sheckard, Juan Gonzalez and Joe Jackson. So Stanton is in great company. 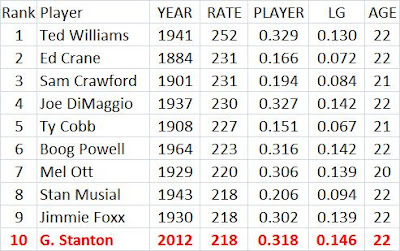 Stanton is one of just 3 guys to have an ISO of at least .275 in 2 different seasons at age 22 or younger. The next table shows all those seasons. Other players with season of .250 or higher were Alex Rodriguez, Juan Gonzalez, Hal Trosky, Frank Robinson, Vladimir Guerrero, Bob Horner, Evan Longoria, Darryl Strawberry. 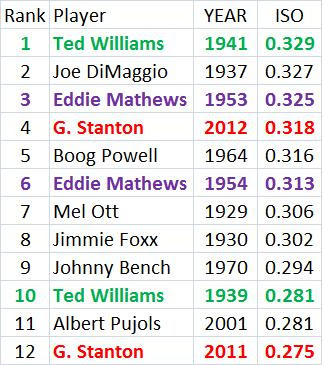 Jimmie Foxx, Mel Ott, Joe DiMaggio and Ted Williams each had one more .250+ season to go along with those seen in the table. His AVG-OBP-SLG in Sept were .269-.315-.420. Those numbers are a bit of a surprise and a bit of a disappointment for the Angels given that he was over 1.000 in OPS in July and August and had .977 in June. The table below shows his OPS+ for each month of his career. 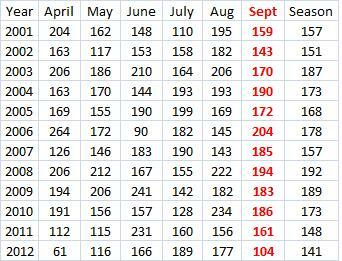 At 104, his OPS+ is far below the next lowest ever for Sept (actually Sept/Oct). The next lowest was 143. It also looks like his 3rd lowest monthly OPS+ ever no matter what the month. In 8 of his 11 previous seasons, his Sept OPS+ was higher than what it was for the whole season. His worst differential had been -17 in 2003. Yet this year it was -37. So his Sept performance was very much out of character. Maybe a normal performance would not have helped the Angels as they finished 4 games out of the wild card. Cabrerra beat Trout in AVG, .330-.326. If Trout had just 3 more hits, he bats .331. I think everyone agrees that Trout was a much better fielder. He probably took away at least 3 more hits than Cabrerra. Trout had 49 SBs while Cabrerra had 4. How many SBs might a HR be worth? What if we said 7? That gives Trout 7 and Cabrerra .571. So if we had 6.3 HRs to Trouts total of 30. So that gets him to 36. Then Trout robbed 4-5 guys of HRs this year. So that puts him around 40 and very close to Cabrerra. Cabrerra grounded into 28 DPs to lead the league. His RBI/GDP ratio was 4.96. Trout grounded into just 7 DPs. His ratio was 11.86. When you calculate value, you have to count the good with the bad. Cabrerra's RBIs were costly in terms of GDPs. Not so for Trout. Even by the conventional stats, Trout looks pretty good. Some of them did it more than once. They all had at least one of those years as the runs scored leader, too. Stirnweiss did it in a war year, 1945. Don't forget that Trout had only 5 CS to go along with his 49 SBs. Probably the best % of any of these guys (although these days the league average is high so I should look into doing it relative to the league average). I searched this by realizing that 15 SBs was the lowest league leading total and 144 was the lowest OPS+ leader. Then I had the Baseball Reference Play Index call up all the guys who had those numbers as a minimum. There were 383 cases and I scanned for bold black on SBs for the leaders and found these guys. Trout went 2 for 3 tonight with a HBP while Cabrerra went 0 for 2. Trout led him in OPS+ 169-167 before tonight. Trout did not steal any bases (had 1 CS). Rajai Davis had 1 SB to get to 46. Trout entered the night with a 129-109 lead in runs scored over Cabrerra. Vladimir Guerrero was the first in 2001-2002. Barry Bonds had 3 such seasons and he is the only other guy to do it more than once.